Running is an activity of repeated impacts, hitting our leg against the ground with every stride. The impact force is equal to the product of the acceleration by the mass (Newton’s second law). The acceleration component is similar, unrelated to the type of strike we use, and refers to the change in velocity experienced by the leg as it contacts the ground. Obviously the faster you go, the higher the deceleration, and thus the impact. The mass, meanwhile, is not the entire body but the part of it that is sharply braked. This is where the kind of strike comes into play. The speed is the same, but when we strike on the heel, the rigid structure that hits the ground is the leg from below the knee as when throwing a punch, from the elbow down it is all a rigid structure. However, with forefoot strike, the rigid portion hitting the ground is just the foot because the ankle keeps mobility, so that the mass and therefore the impact is much lower. Following the example of the punch, this strike is more like a slap. So we can choose between receiving the impact of a punch or only a slap by just changing the part of the foot we use to land. Many shod runners change to forefoot strike when are asked to run barefoot. Why? Because running on the heel without shoes is like punching a wall without boxing gloves, it hurts. Cushioning the heel to avoid pain does not diminish the magnitude of impact, we just don’t feel it. It therefore seems reasonable to assume (it has not been proven yet) that the incidence of injuries derived from repetitive impacts will be diminished if the magnitude of impacts decreases, and this occurs (and this has already been proven) when we land on the forefoot rather than on the heel. When running barefoot we automatically adjust the leg stiffness to the surface hardness thanks to information provided by the feet. If we try to hit stronger, it hurts. However, wrapping the foot in a cushioned shoe makes it “blind” which allows us to be able to receive much higher impacts free of pain, but this does not avoid the impact we receive,. It only prevents us of feeling pain, so this is similar to turning off the security system. 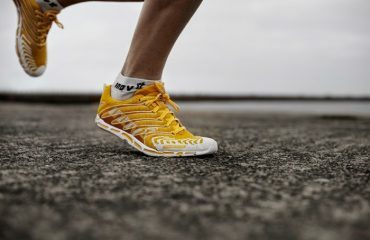 So, are we saying that it is wrong to use modern running shoes? As mentioned before, there are no studies demonstrating the superiority of the forefoot strike as far as injury prevention is concerned yet. However there are two points to make on this issue: First, since the advent of modern shoes in the 70s, despite the research efforts to improve design, the incidence of injury has remained stable. Second, it is likely that throughout human history, until the appearance of these shoes, we didn’t run using heel strike as evidenced by the fact that as soon as we take off our shoes, we stop heel striking in most cases. So, if you enjoy running with conventional shoes and have had no problems, go ahead. But if you are suffering from knee pain, low back pain, plantar fasciitis, etc. it might be interesting to consider a change of style. If we plan to change the style, it is advisable to consider a few things. There is no single perfect running form. We have to find our own way by listening to our bodies, particularly our feet. The best way to listen to our feet is temporarily removing the shoes. We seek a hard, flat surface and run on it. Our body will automatically seek and find the best strike. Contrary to what you might think, it is better to run on a hard surface. If the surface is too soft, the body does not need to look for the right landing and you might not learn the proper technique. I used to guide myself by the noise. I think that the less noise I produce the softer I’m striking the ground. We have the feet under the body instead of landing too far in front of our hips. The pace should be fast, at least three steps per second (180 / min). The fewer steps per minute we do, the more time we’re on the air per stride; and to “fly”, we need to spend energy to give vertical speed to our body. Conversely, if we fly less, we will be saving energy. The strike is like when we land from a jump, falling on the ball of the foot with knee and hip slightly bent, then let the heel down under the control of the calf muscles.